Chief Minister Pema Khandu today officially inaugurated the first civil service coaching centre in the state capital here today. A reputed coaching institute – ALS IAS (ALS for Alternative Learning Systems) – a premier civil service coaching institute based out of New Delhi, with the initiative of Helping Hands, an NGO, and supported by the state government opened its study centre here at Niti Vihar bringing respite to hundreds of civil service aspirants, who cannot travel to bigger cities to avail the much needed guidance and grooming. The coaching center here will use the latest satellite telecommunication technology and will be a part of ALS’s centralized classroom. Students here will directly interact with trainers/teachers at Delhi and classes will be held from Delhi through satellite. 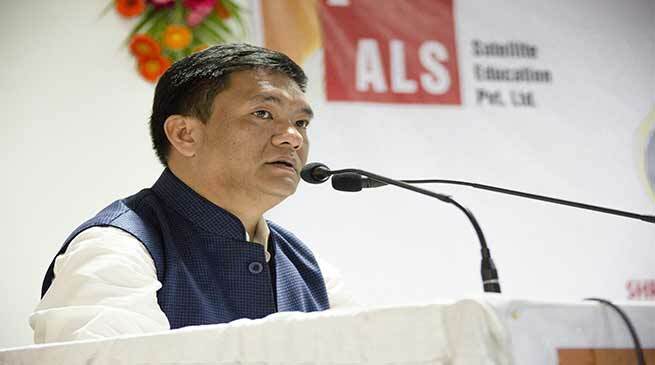 Khandu expressed gratitude to ALS Chief Executive Director Jojo Mathew for the initiative of bringing quality coaching facilities for civil aspirants of the state to their doorstep. “Historically, it is observed that the representation of northeast India, especially Arunachal Pradesh in the elite services is very minimal. This is an area of major concern. It is not because our boys and girls are less talented or less capable. It is because of the lack of coaching facilities,” the Chief Minister observed. In order to encourage UPSC aspirants, he informed that the state government has fixed financial incentives to students clearing- prelims/mains and interviews. These incentives were enhanced last year from Rs. 30,000 to Rs 2 lakhs on qualifying the Preliminary exams and from Rs 50,000 to Rs 3 lakhs on qualifying Mains exams. “In 2016-17, we disbursed the incentives to 9 candidates for Prelims and 4 candidates for mains. We have received few applications this year too,” Khandu informed. The Chief Minister also announced a restructured financial incentive “CM’s Civil services financial incentive scheme”, wherein the government will tie up with institutes like ALS and other such institutes with an end to end solution. Focus will also be laid to guide and nourish candidates for UPSC conducted NDA and other allied services examinations. Khandu revealed that few other reputed coaching institutes have also expressed interest in opening centers in the state and assured cooperation from the government. He said a healthy competition amongst these institutes will augur well for the local aspirants. Recalling his recent meetings with the Union Home Minister and the Minister of State for Personnel & Training, Khandu said he has sought separate IAS/IPS/IFS cadre for the state as presently Arunachal is under the combined AGMUT cadre which is a joint cadre for serving Arunachal Pradesh, Goa, Mizoram and all the Union Territories. While informing that the Union Ministers have positively responded to his plea, he said future is very bright for indigenous youths opting for civil service as their careers. Education Minister Honchun Ngandam in a prolific address called upon the youths to take hold of the opportunity with both hands. He pointed the generation of his time have not been so lucky to have educated parents, who dedicate their lives to make the lives of their children. “You all are lucky. You have parents who earn to pay for your education, you have access to schools and colleges to educate yourself and now you have a reputed institute to guide you through the civil service examination. It is up to you to take these advantages to your advantage,” he said. Ngandam reminded the students that they are not inferior to anybody but need discipline and hard work to succeed in life. “We as elders and leaders in the government can only show you the path but it is up to you to walk that path. I hope to see our boys and girls crack the most prestigious exam of the country in good numbers in near future,” he added while elaborating on steps taken by the government to improve the education scenario in the state. Joint Commissioner of Police Robin Hibu, the first IPS from the state, who’s NGO Helping Hands has been instrumental in setting the ALS center in Itanagar and Armstrong Pame (IAS), deputy commissioner of Tamenglong district, Manipur and a product of ALS also spoke on the occasion while Jojo Mathew gave a brief history and achievements of ALS. Dignitaries present on the occasion included Parliamentary Secretaries Tesam Pongte and Laisam Simai, APCC President Takam Sanjoy and PPA Chairman Kamen Ringu. The Itanagar centre will be the 51st of ALS that already has 50 branches across the country. ALS has the distinction of having the highest number of coaching centres in the country. This year 231 of its students cracked the UPSC exams while it has guided 2349 students to success in the last 16 years since inception.